Pirelli's Diablo Rosso 2 is the sportiest and most versatile road-oriented tire of the Rosso Generation. This supersport radial is perfect for all riding conditions, including the wet. It features a tri-zone dual compound rear, and the Diablo Rosso 2 has a high-grip compound on the shoulders and a wet / mileage compound in the center. 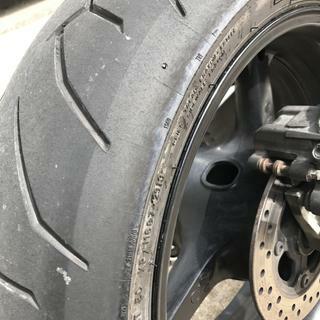 The tire's grip is enhanced even further by EPT (Enhanced Patch Technology), a technology developed in the World Superbike, and a maximum contact patch area is due in part to an ICS (Integrated Contour Shaping) technology, complimenting handling and power of today’s modern motorcycles. 2 thumbs up for Pirelli. It's amazing how a good tire changes the attitude of the whole bike. These tires stick great in the corners, track in and out of corners beautifully, and run super smooth on the highway. I don't ride in the rain so I can't speak for wet weather yet, but so far I love these tires for the money. This tire provides great front end feedback and always feels planted solid in the turn. It also holds up with high performance response required at higher speeds. It will hold up with a fair amount of durability as well as performance. Was skeptical at first of the center height. But this tire does initiate turn very well. Feel very confident while cornering. Best price I could find at rocky mtn atv. Awesome shipping speed. Installed and balanced tire myself. And is very smooth at any speed. Have used these of a supermoto, naked bike, and Yamaha R6 for street and track days. Great performance. I've been through a number of Pirelli tires on various sport bikes and the Diablo Rosso II's are my new favorite. Incredible grip in the dry and very stable on wet pavement. 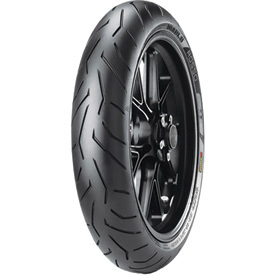 As the title suggests, this tyre gives my Diavel all the grip she needs up front. Original equipment and I've already bought a second set plus one set for spare. Mileage was around 7500km and suprisingly, although I replaced the rear at the same time it was in slightly better condition. I bought two sets from Jake Wilson and the price and delivery were second to none. Will this fit on a ninja 250? BEST ANSWER: I have no idea, check with your Kawasaki dealer. I put it on a '07 MV Agusta F4-1000R. I think you need a 110 but a 120 might fit..